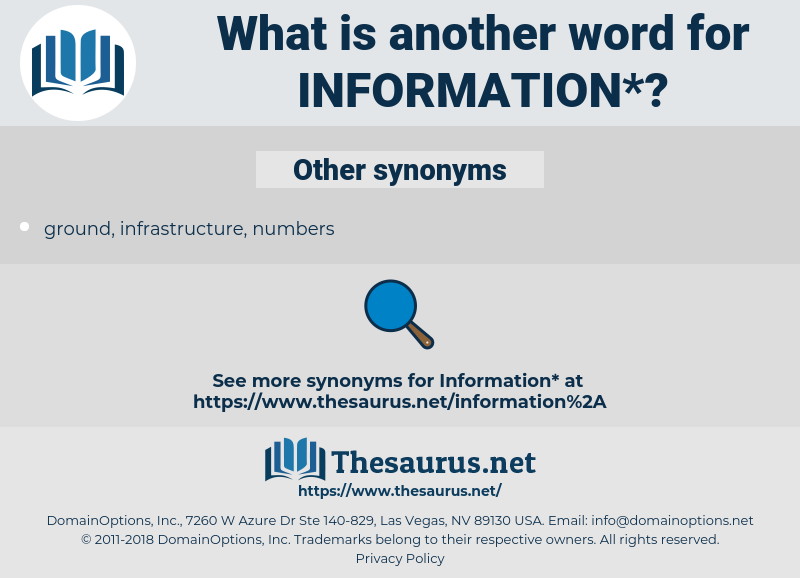 What is another word for information? factors, Recommendations, explanations, annotations, nations, observations, identifiers, complaints, requirements, Rights, dossiers, conclusions, comments, lessons, benefits, characteristics, hints, prompts, Interviews, Entries, organisms, Nis, shipments, annexes, Measures, Replies, items, priorities, sectors, Guidelines, PROSPECTS, Opportunities, enterprises, media, tips, TBS, aspects, visits, problems, events, outputs, Bodies, colleges, GS, meetings, goods, informatization, details, briefing, briefings, informing, infomation, communications, notification, informed, informationen, renseignements, clarification. updates, specifics, Brochures, kits, readings, leaks, dots, media, details, briefings, renseignements. 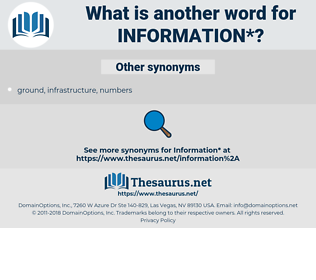 prompts, media, tip-off, mation, informatization, explanation, informing, infomation, communications, informacji, notification, elaboration, intelligence-gathering, ation, precision, clarification. misinformed, found, briefed, Inquired, Told, organised, received, enquired, conveyed, used, heard, Were, Assessed, added, requested, Took, Had, Did, briefing, briefings. Notifying, pointing, identifying, Noting, changing, filing, appraising, falling, Arising, Stating, Depending, reaching, according, giving, acting, keeping, looking, speaking. learned, Notified, Indicated, updated, disclosed, documented, Administered, briefed, advised, accessed, Told, contained, warranted, alleged, received, mailed, directed, Captured, completed, placed, isolated, replaced, requested, Accorded, handled, posted, attached, studied, educated, informed. includes, remains, relates, proves, serves, states, Does, comments, prompts, renseignements. submissions, insights, sources, Newsletters, feeds, reporting. informationization, intelligence, inform, reporting, briefing, documentation, instruction. informs, briefing, briefings, informing, informatics. No, my dear sir; I look for information from you. This information disturbed Dan Fernald not a little. stimulant, condition, conversancy, input, grounds, stimulus, background, fact, conversance, data point, illustration, instance, acquaintance, representative, evidence, Familiarity, stimulation, tip-off, circumstance, example, predictor, consideration, descriptor, datum, background knowledge.